In recent years, the regional labor shortage problem in China has gradually developed into a national one. The Beijing authorities have announced at the beginning of the year that the labor force in China is currently shrinking while the International Monetary Fund (IMF) has forecasted a possibility of a sudden plummet on it as well. Apart from the severe labor shortage, the manufacturing industry is also facing other challenges, which are energy conservation and emission reduction. In China’s latest five-year plan, a number of indicators for environmental protection have been set, such as a target of 16% fall in energy usage has been proposed. Also, carbon emissions per GDP unit are targeted to be reduced by 17% for the first time and the total energy consumption of coal equivalent will not exceed 4 billion tons till 2015 from now. CHINAPLAS 2013, which will be held on May 20-23 in Guangzhou, China, will introduce revolutionary solutions to all challenges encountered by enterprises. This year, there will be more than 2,000 exhibitors, including Keba AG, B&R, Alfa, Mirle, Kawata, Matsui, Siemens, etc, showcasing different types of automation technologies, production lines, machinery and auxiliary equipment, which can be found in the 11 theme zones, including extrusion machinery, injection molding machinery, film machinery, rubber machinery, plastics packaging, blow molding machinery and auxiliary equipment, etc. For example, B&R’s Panel Based Control is an all in one device with PLC, motion control and visualization, which can connect to Intel Atom platform and apply in complex industrial robot and CNC. It is available in all kinds of sizes and can be applied with touch screens for easier operation. Meanwhile, Kawata is showing its Automatic Metering and Mixing Machine AC series. The application of screw measurement technique enables a stable ratio and easy operation, which only requires setting the ratio in the ratio regulator, with two times of pumping for mixing in the pipeline. No special maintenance is needed. Along with the increasing global concern for green manufacturing, bioplastics has become a more significant element in the plastics industry. CHINAPLAS has established the bioplastics zone since 2011. In response to the market demand this year, the number of exhibitors will be increased by 20%. The participating enterprises include Kingfa, Hisun, Ecomann, Fukutomi, Wuhan Huali, Natureworks, Cardia, Esun, Xinfu and Jinxiang, etc, which will cover bioplastics-related exhibits like PLA, PHA, PBS, PA610, PA1010, bio-based PE and bio-degradable plastics. In view of the growing market demand and overwhelming response received last year, the organizer, Adsale Exhibition Services Ltd and Shenzhen Plastics & Rubber Association will jointly hold “The 5th International Seminar on Bioplastics Applications”. The conference will be held two days prior to the show from 18-19 May at the Pearl River Hotel, Guangzhou Military Region. 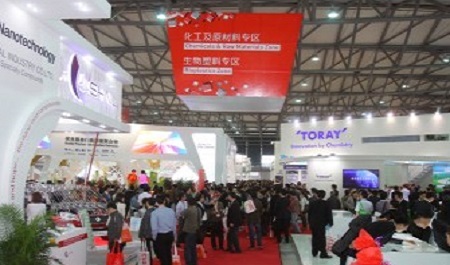 CHINAPLAS 2013 is expected to reach a new record with an exhibition area of more than 220,000sqm, and the participation of over 2,900 Chinese and overseas exhibitors from 38 countries and regions, together with 14 country pavilions from Austria, Canada, France, Germany, Italy, Japan, China, Korea, Singapore, Switzerland, Taiwan, Turkey, UK and US, which will jointly showcase diversified chemical and raw materials and over 3,200 units of rubber and plastics machineries. The four-day trade show will attract more than 115,000 professional buyers from 150 countries and regions.